Today, my friends, we discuss a rather unique Ability, and in some ways, We can dream, people.every Ability. A passive power that will turn any opponent into the Darth Vader to your Obi-Wan, the René Belloq to your Indiana Jones, the George Lucas to your competent fan base. This Ability creates the ultimate antagonist to your adversary: yourself. This is Ability of the Week: Trace! Introduced in the third generation, Trace is usable by five pokémon, and unlike most of the Abilities I’ve discussed in this feature, the list has not expanded at all since its inception. Porygon, Porygon2, and Ralts and its evolutions are the only monsters you’ll find with the capacity to know Trace. When a pokémon with the Ability is introduced into a battle, it will automatically copy the opponent’s Ability (unless that Ability is Wonderguard, Multitype, or Illusion). In the case of a double or triple battle, Trace will randomly select which opponent’s Ability to copy. Now, due to the nature of Trace, it’s difficult to nail down a solid strategy to utilize with it. If you have a friend that you battle against regularly, a Trace-user could be handy to use because you probably know their strategy, but for the most part, this Ability forces you to think on your feet. I think the handiest thing you can do is fall back on one my favorite standbys: the Bait and Switch strategy. (Full disclosure here, I’ve been at the receiving end of the following combo by virtue of my own stupidity and lack of paying attention to my battle.) Let’s say you’re packing a Gardevoir with Trace in your roster, and your opponent sends out a monster with an Ability that allows it to absorb moves and gain a stat boost… like an Electivire with Motor Drive. And then because that Electivire doesn’t have any moves that are super effective against a Gardevoir, it attacks with the next best thing, and STAB’d Thunderpunch. And then because that Gardevoir has Trace, its copied Motor Drive, receives no damage, and gains a speed boost. Like the guy whose name I don’t recall that I was fighting at the Midwest Gaming Classic last year did. Okay, yeah, Wil’s dumb, let’s all point and laugh. The point is, learn from my idiocy and translate it into a strategy to use against your opponents! Be on the lookout for monsters with Abilities like Motor Drive, Dry Skin, Sap Sipper, and so on, and try to goad your opponent into using a move that would activate their own Ability if you used it, and profit! See if you can come up with some more imaginative ways to utilize Trace. 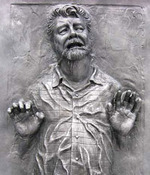 As for me, I’m gonna continue researching real-world carbonite freeze for the good of mankind. You’ll thank me when Han shoots first again in the Episode IV 3D rerelease.